EasyGoingSurvey.com gives you all you need to be able to create your own online surveys. EasyGoingSurvey.com is the No. 1 online survey application in Europe and Latin America. 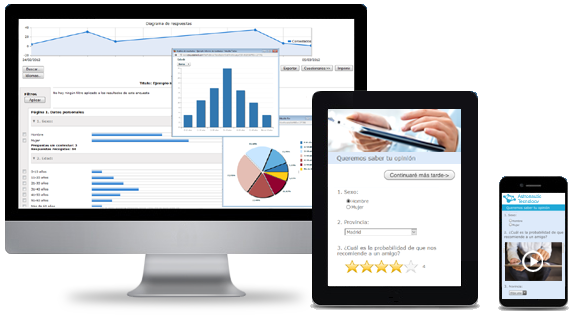 It allows users to quickly and easily create internal and external surveys which help decision making. EasyGoingSurvey.com allows information to be obtained in record time and with hardly any resources. EasyGoingSurvey.com is, by far, the easiest online survey system of all the ones I have tried. I would recommend it to everyone. EasyGoingSurvey.com is an easy-to-use tool at an incredible price. The best thing is that its human team quickly solve your doubts and they are always very decisive. Compare our free version with any of our competitors… you will find that EasyGoingSurvey.com is difficult to match. Compare us!